Happy Halloween!! It has been a few years since dressing up for Halloween, but this year we were invited to a costume party with a prize for best costume, so it was on! After wracking our brains and much research on Pinterest, we finally decided on Zombie and Zombie Hunter. I have always wanted to do a creepy costume and have been intrigued by the cosmetic contacts, and this was my chance to go all out. When coming up with a zombie costume, it is always a good idea to come up with your characters’ back story. What were you doing when you were turned into a zombie? Sure you could be wearing just about anything torn-up with blood on it, but some of the best zombies have a story, like a zombie nurse, or cheerleader, or just out of bed with curlers still in. Or what about a zombie bride and groom? With that in mind I decided to be a zombie sorority girl. Not a hard one being that I was in a sorority and knew I could whip up a pair of letters to use with left over fabric and puff paint. Matched with old ratty jeans and you have a costume. Step 1: Gather up all your clothing and props. 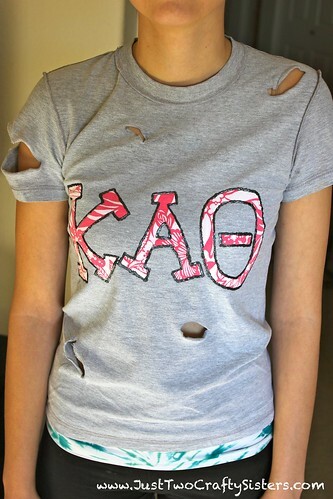 I used my “crafting” jeans that already had tears and paint on them and my sorority shirt. For Alex, we found a trench coat at Goodwill, an old pair of jeans, and a few props (hat, bullet belt & axe) from a Spirit store. 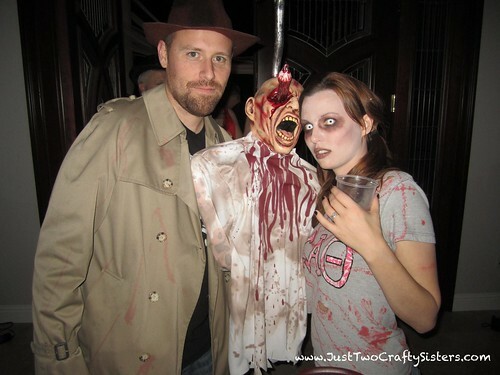 We also bought a zombie make-up kit, fake blood spray, and zombie contact lenses to complete the look. Step 2: Time to start making your costumes. Take scissors and cut into your shirt. It looks more authentic to start the holes with scissors, but then pull on them to rip larger and more naturally. and then Alex’s trench coat. 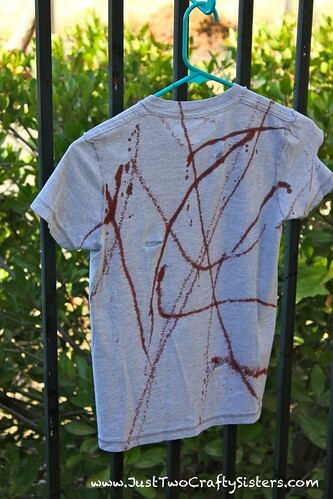 To make it look more authentic than just sprayed blood, we also did smears and hand prints. 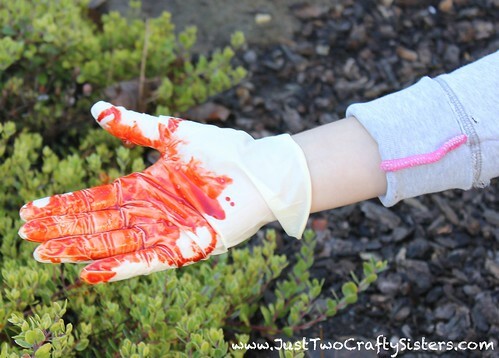 For this I put on a latex glove so that my hand would not be stained. 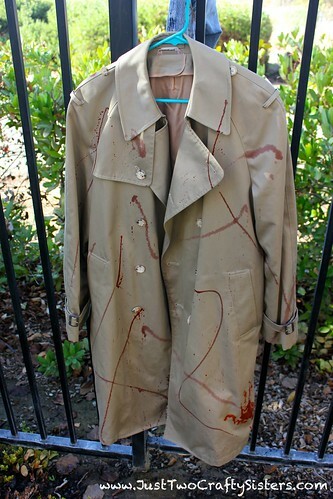 With my hand covered in fake blood, I placed it firmly on the trench coat in a few places, like the shoulder and back of the coat as if zombies and been grabbing it. 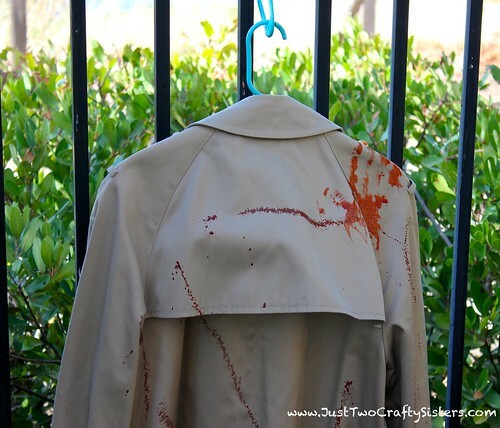 It looks so good here, but as the blood sried on the trench coat, it lost a lot of the vibrancy. 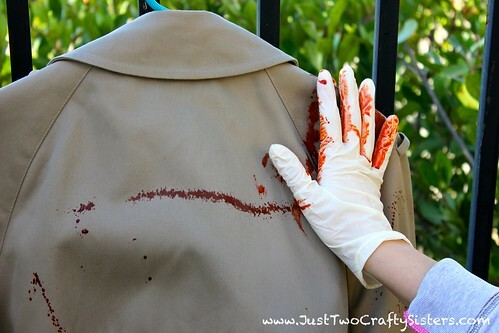 It is a good idea to test out your fake blood in advance, because it can soak in and fade on some fabrics. If we had more time, we would have done more blood splatters with actual paint to help enhance the look. 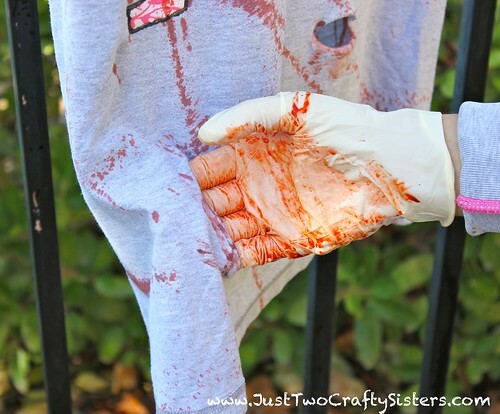 Using my fake blood covered hand, I made a point to grab at all the tears in my shirt to make them more fun and gruesome as well. Please keep in mind, for a zombie costume, make-up is key. Click here for my zombie make-up tutorial. Pale face, bruising or scars, blood and dirt make for the creepy appearance. 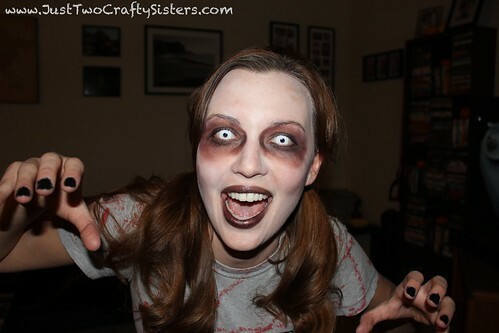 For the best effect, Halloween contacts in white, yellow or red are amazing. There you have it. 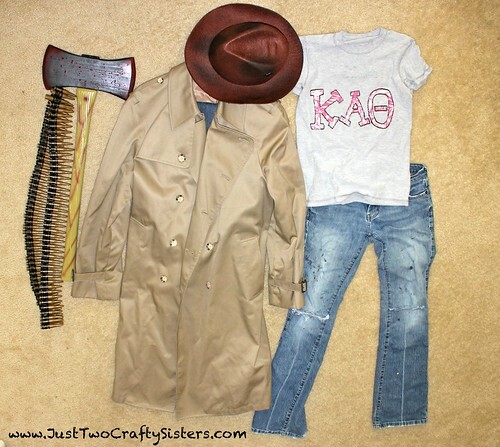 Sorority zombie girl and Zombie Hunter couple costume. I hope we get to dress up again next year. Too fun!! 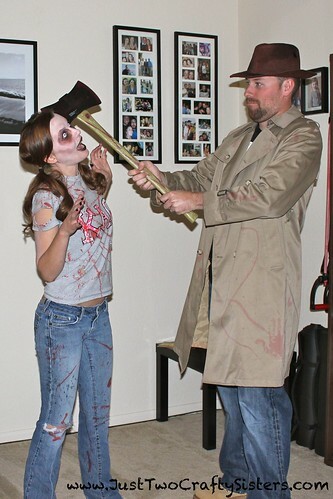 do you have any ideas for a girl zombie hunter costume? Womens Zombie Hunter Costume i saw online that is not bad. Or you could DIY one similar to my husbands with a thrift store women’s trench coat, ripped tights, short skirt and boots. Let me know how your costume turns out!